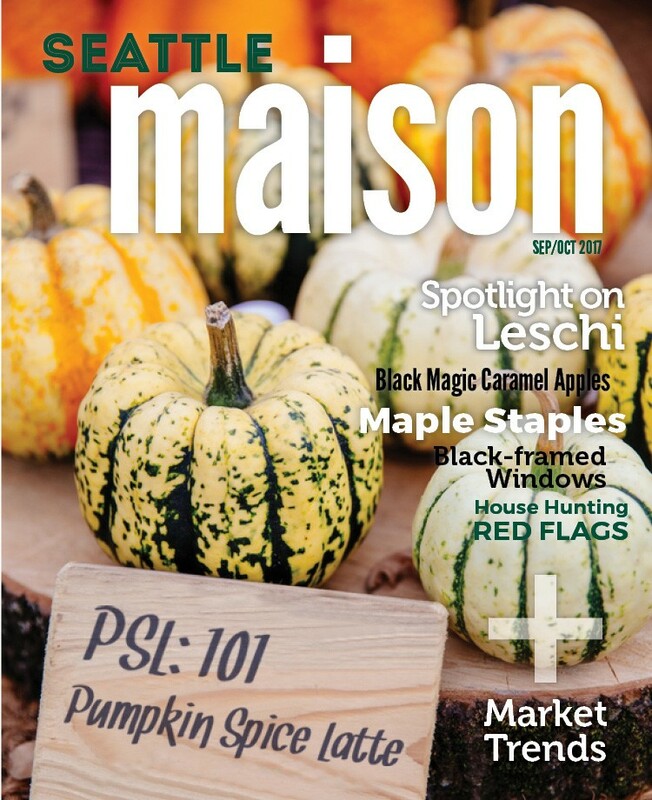 The Fall issue of Seattle Maison is GORGEOUS! I am really in love with the content. The lead article is right up my ally – it’s all about coffee, specifically pumpkin spice lattes. Can you believe they are already here? Learn all about adding maple trees to your home’s landscaping in Maple Staple. Six different varieties, and their features, are covered in this article. The neighborhood spotlight is all about Leschi, one of my favorite neighborhoods in Seattle. Get the scoop on the parks and dining scene, along with a bit of neighborhood history, in this fantastic spotlight feature article. What are some red flag warning signs when you are house hunting? There are eight outlined in the article, House Hunting Red Flags. These warning signs could spell trouble no matter what neighborhood you are looking in. I think my favorite article in this issue of Seattle Maison delves into black window frames, which work with a variety of architectural styles. However, are they a good idea all the time? Dive into this article to find out! 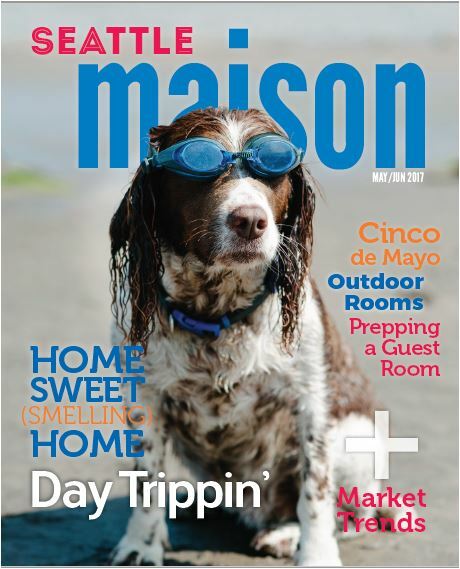 Click here to read the Fall issue of Seattle Maison from cover to cover. The Spring 2017 issue of Windermere Living is fabulous! This is the first issue of Windermere Living featuring homes from around the Western United States. Since Windermere Real Estate is a regional real estate company, with over 300 offices spread across 10 states, it makes perfect sense to broaden the scope of Windermere Living from the Pacific Northwest to all the Western states where we have offices. I’m so honored to be featured in this issue, on pages 28 & 29. My feature includes 6 of the properties I sold in recent months. My featured properties include both buyer represented and seller represented homes. I hope you enjoy the latest issue of Windermere Living as much as I have. If you would like to have your own copy of this magazine, please send me an email at kathryn@windermere.com. 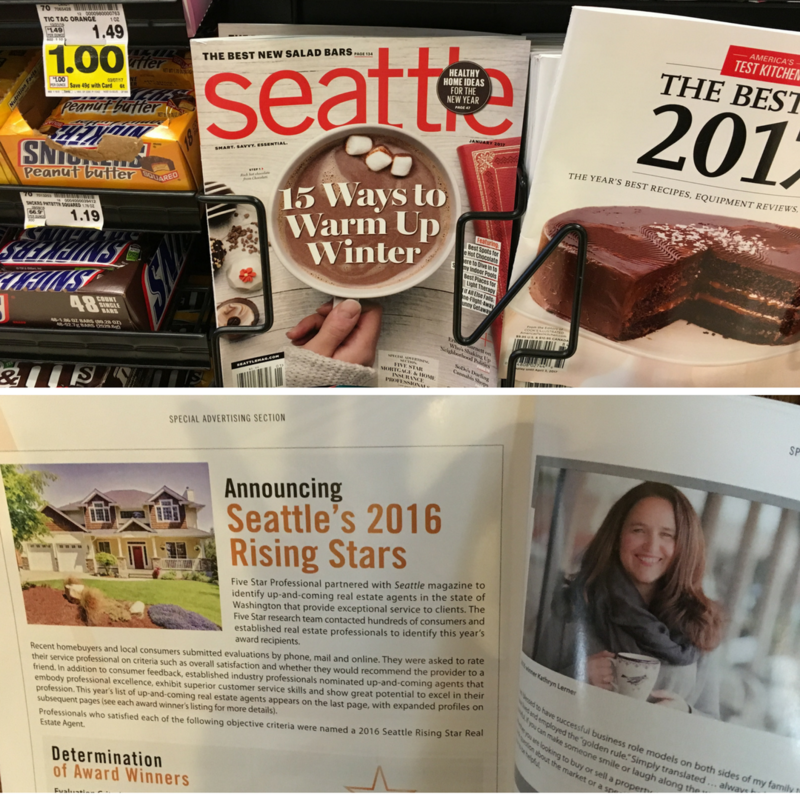 The Seattle Magazine featuring Five Star agents is available at newsstands now! The Seattle Magazine featuring Five Star agents is available at newsstands now! Thank you to all my wonderful clients for letting me be a part of your story in 2016 and sending in your positive reviews. Your acknowledgement of my real estate guidance is what enabled me to be selected as both a Zillow All Five Star Broker & a Seattle Magazine Five Star Winner in 2016. I enjoyed every minute of working with both buyers and sellers this past year, and I look forward to serving clients with the same eye towards excellence in 2017. 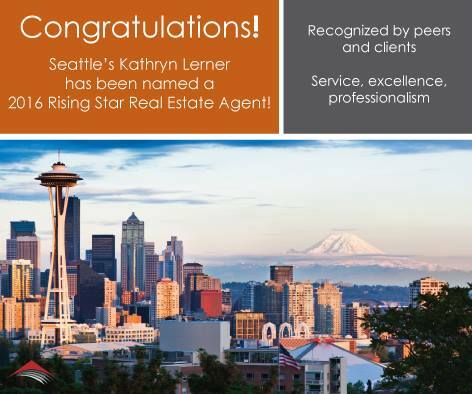 As a recipient of the 2016 Rising Star Real Estate Agent award, I have been recognized by clients and peers for the work I do. I’m very humbled to receive this award from Seattle Magazine, and grateful to my clients and the team of professionals who help me deliver top notch customer service. I love my job, and am really excited to see where the Seattle housing market is headed in 2017. Thank you for being a part of my journey. Windermere Living goes global with its content this quarter, including the scoop on pasteries from around the globe and an article titled, "Selling Significant Properties In a Dynamic Global Marketplace." The Exploration section even features information about booking photographers internationally for special vacation photo sessions. Don't forget to check out my feature — it's located on page 27 of the magazine. The Fall issue of Windermere Living Magazine is now available to view online. Enjoy!